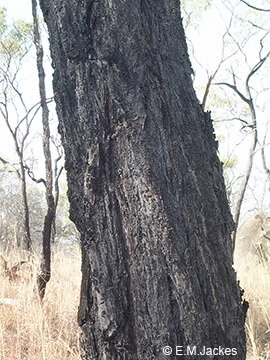 This tree is distinguished by its dark grey, deeply fissured bark that is persistent to the branchlets. The capsule is 4-6 mm long and the valves are level with the rim or slightly exserted; flowers white. This species is very similar to E. crebra, however the capsules are larger and there are several other differences. Chiefly occurs in coastal areas.